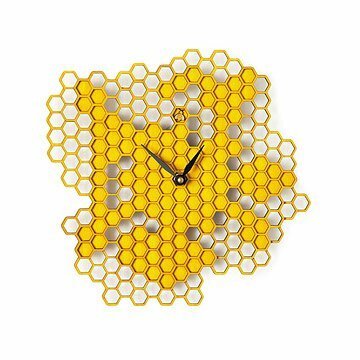 This honeycomb clock is laser cut from layers of wood and given a cheerful, honey-yellow finish. Time sweetly flies when you're watching it pass on this nature-inspired clock. Created by Lance Nybye Jr., he combines the geometric beauty of honeycomb with the human innovation of laser-cutting technology. The delicate, hexagonal lattice is created by precision-cutting decorative plywood, which is then hand-glued to create a layered look, and given a coat of cheerful, honey-yellow, water-based dye. A single, laser-cut honeybee rests in the 12 o'clock spot. The clock adds a burst of cheery sweetness without taking up much wall space, and makes a buzz-worthy addition to your kitchen, sun room or office. Handmade in San Diego, California. Replacement was delivered quickly, but the problem is that the knurled nut holding the hands in place is not tight. It works its way off. The replacement nut was also lose and if you tighten it too much the hands can't move. Design flaw. If you hang the clock on the wall and the nut comes off, one can never find the nut to place back on the clock. Love the look and the timepiece keeps good time as all those units do. My grandson's bedroom was just transformed into a teen room and he is heavy into Terreria which is involved with bees and hives at the moment. When I found this clock in a catalog he was immediately excited to get it. We want him to love everything in his new room. Since it is yellow,of course, and a busy hive, it is a little difficult to read. The bottom line however is that he loves it. I was really surprised at how small this clock actually is. It is well made, but IMO too pricey for the small size and flimsy generic plastic backing. The honeycomb shapes are cool and we are fans of bees, so I do like the design. Really wish it was 50% larger at this price! The clock arrived very quickly after being ordered, well wrapped to protect it so it arrived in perfect condition. I like the honeycomb design. Its 'nature' theme fits well on my seasonal porch. The lack of numbers suits me, too, since approximate rather than exact times are appropriate when relaxing outside. My only complaint: though the hands are black and the clock yellow, I did find the hands difficult to see. Perhaps they need to be larger? But painting them a neon yellow brighter than the clock color has fixed the problem for me and I'm delighted with the clock.